Having a successful digital signage network relies heavily on taking the right decisions at key moments and avoiding obstacles and hindrances. Gaining early access to some sound advice from industry professionals will help you plan a streamlined and smoother course. So, how do businesses achieve this? Samsung is a global leader in display technologies and digital signage solutions. Over the years, they have accrued significant insights in integrating display, signage, and visual communication solutions for some of the biggest enterprises in the world. They have used these key insights to develop a detailed and informative whitepaper to help businesses harness more from Digital Signage Solutions. How can curious businesses navigate the complexities and hone in on the technologies that will truly make a positive impact? Three enhancements, in particular, can make a significant difference in optimizing content for brilliance, precision and expanded engagement. Authored by Mr. Eric Lee, Director, LED Signage Product Planning Group, Samsung Electronics, the whitepaper helps shares these 3 keys aspects to a successful LED installation that will help businesses drive the greatest ROI. By understanding what features and enhancements will drive the greatest results, businesses can enjoy new possibilities to share compelling content and attract wider audiences. Actis Technologies is one of the leading AV integrators providing enterprise-grade Samsung digital signage solutions in India. 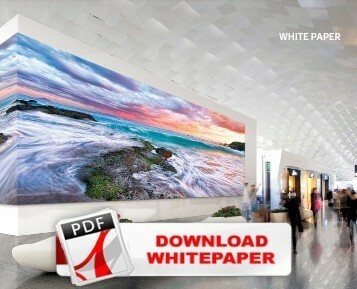 As an authorised and preferred Samsung India Business partner and Digital Signage Solution integrators, we have taken up the responsibility of making the whitepaper available to you easily. Scroll to learn the contents of the whitepaper and to access the download link. What does the whitepaper cover?